I would like you all to meet my love muffin, a beautiful 80lb lab cross named Bella. 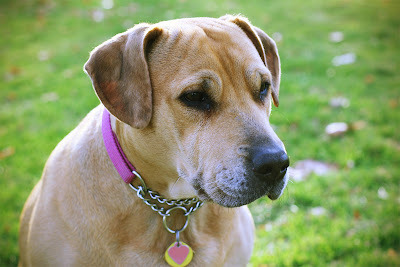 She is a rescue dog that started as my foster from All Breed Canine Rescue, that I feel in love with and had to adopt. Her story starts off sad with abuse, neglect and half a cut off tail, but now she has a happy, spoiled life. Her day consist of many naps, squeaky toys, weekly trips to the dog park and scavenging for food. She loves food so much she figured out how to open the fridge to get to the butter, she can also break into her food container. She hates snow, rain, getting out of bed before 10am and other dogs taking her toys (I said she was spoiled). I get way more love and enjoyment out of having her than I think she does out of me. She is my snugly, lazy Bella and I am so glad she came into our lives. Please opt to adopt, there are so many good animals out there who need forever homes! !